To ‘carry off the audience to emotionally deep experiences’ was Stijn Celis’s stated aim for his new “Romeo and Juliet” adaptation at Dresden’s Semperoper. His approach is totally modern, avoiding any reference to the Renaissance. The Belgian choreographer wanted his work to be ‘linked to reality’ and to abstain from ‘artificiality and deformation’. Did he accomplish these noble goals? Concrete dominated the set, aptly so for a current approach. Gray walls served as a church interior or as facades of austere homes. Two large windows allowed either a view into what was going on in apartments or, when the windows were opened, served as balconies for the two lovers’ core encounter. The atmosphere was as gloomy as Jan Versweyveld’s decor. 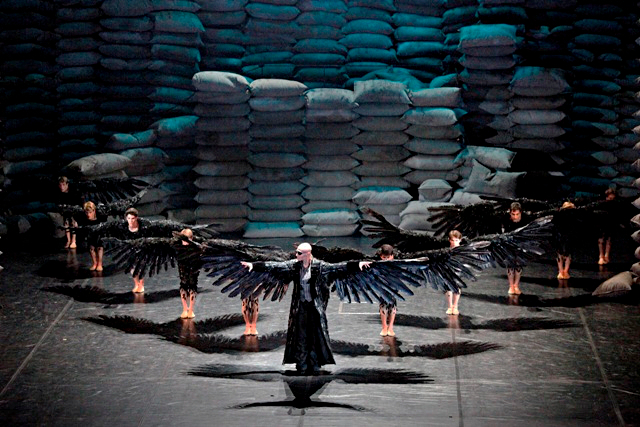 Terrifying things happen in “Krabat” by Demis Volpi, resident choreographer of Stuttgart Ballet. It is the story of a beggar boy apprenticed along with eleven other fellows to a mill master who is an evil magician. Only a young girl’s love for Krabat, the central boy, finally breaks the magician’s power. This, Volpi’s first program-filling ballet, is based on a novel of the same name by Ottfried Preußler (1923 – 2013). Born in Bohemia, Preußler wove his experiences during World War II, including five years spent in Russian captivity, into the story. However, he set the plot in the 18th Century, during the Great Northern War (1700 – 1721) in Lusatia. The mill represents a place where humans are scorned and killed, literally ground, as the millstones not only pulverize grain but also human bones that are regularly delivered by the Grim Reaper – a figure even the mill-master/magician dreads. 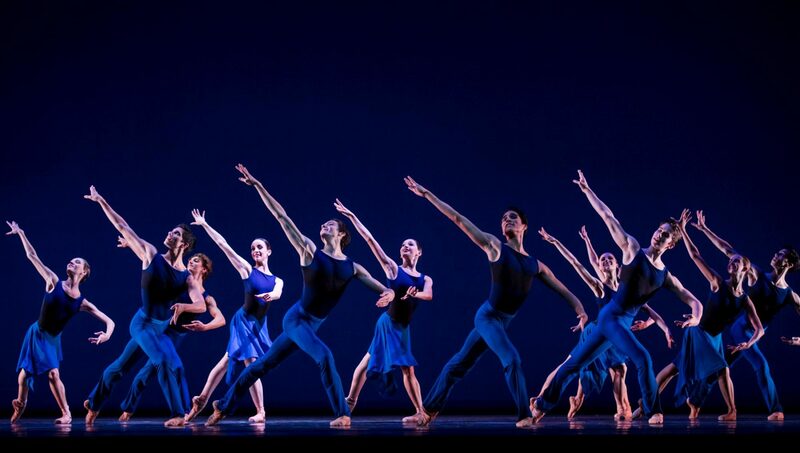 “Forever young”, claims the Bavarian State Ballet, are the pieces on this eponymous triple bill, which premiered last season. At least two of them – “The Moor’s Pavane”, choreographed in 1949 by modern dance icon José Limón, and “Choreartium”, choreographed in 1933 by Léonide Massine – are said to be masterpieces exempt from aging. The third, Russell Maliphant’s “Broken Fall”, dating from 2003, has yet to prove its endurance. The evening started with the contemporary “Broken Fall” and turned back along the timeline to the modernist classics. Created for the Royal Ballet, or more precisely for Sylvie Guillem, the Maliphant work toys with gravity and the risk of falling by challenging the body control of three dancers. It tests the limits of mutual trust. Set to artificial soundscapes by Berry Adamson, the atmosphere was slightly surreal. Two men and one woman – Matej Urban, Nikita Korotkov and Ekaterina Petina -, bare foot and clad in shorts and simple tops, gave little samples of their abilities in passing. They seemed cool professionals engaged in casual training. Their interactions began with slow motion lifts and counterbalances, the interactions becoming more and more risky. Petina’s knee pads seemed to proclaim that, in the sports context, no hazard would be avoided. The three dancers’ faces were, aptly, serious throughout. Although the dancing had the appearance of contact improvisation, it lacked spontaneity and play. Everything was too well-calculated. Lifts and falls were audacious, yet all motion had a smooth quality with the transitions, especially, being softened. Consequently, the interaction of strongly contrasting forces was pretty much watered down. What we got was a physical gymnastics demonstration. Petina, in her final solo which included some classical dance vocabulary, had feline strength, radiated power and was expressive – more so than anything preceding this display.